We got our first snowfall of the New Year! We have about 1 1/2″ or so, not a lot just enough to make it messy on the roads this morning. We were right on the line of heavier snow. Just 4 or 5 miles just North of us they have around 4″ or 5″ with higher amounts as go more North. With the Snow and Cold outside, it’s time for a Comfort Food Dinner on the inside! 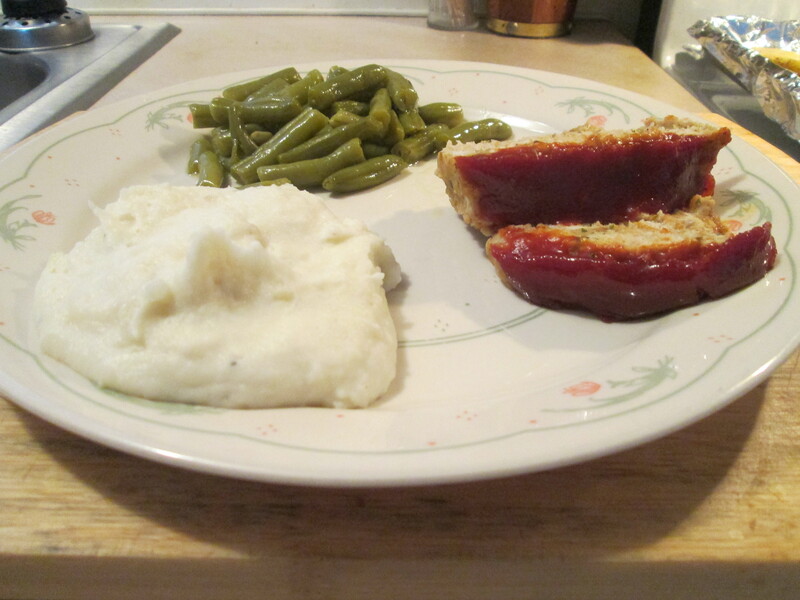 I prepared a Turkey Meatloaf w/ Mashed Potatoes and Cut Green Beans. 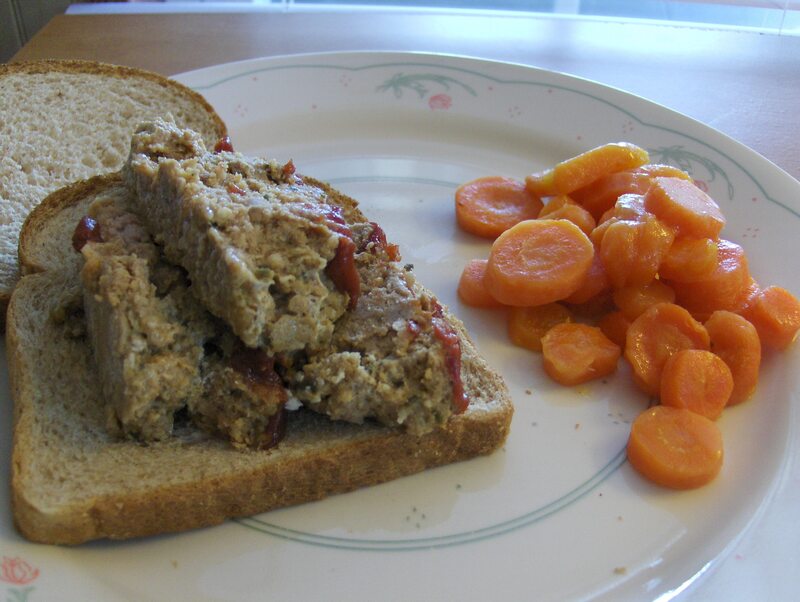 I love this Turkey Meatloaf, I need to make it a lot much more often. I always use Jennie – O Extra Lean Ground Turkey Breast when I make it. To prepare the Meatloaf I’ll need the following; 2 Tablespoons Blue Bonnet Light Stick Butter, 3 Cloves Garlic (Minced), 1 lb Jennie O Extra Lean Ground Turkey Breast, 1/2 Cup Progesso Italian Style Breadcrumbs, 1/4 Cup Egg Substitute (Egg Beaters), 1 1/4 Cups Hunt’s Ketchup, 4 Tablespoons Worcestershire Sauce, 3 Tablespoons Heinz 57 Sauce, 2 Teaspoons Smoked Cumin, 2 Teaspoons Onion Powder, 2 Teaspoons Ground Thyme, 2 Teaspoons Parsley, and Sea Salt and Black Pepper (To taste). Preheat your oven on 350 degrees.To start I melted butter in a medium skillet. Add the Garlic in the melted butter for 4 minutes, stirring occasionally. When done place mixture in a large bowl to cool for 5 minutes. In a large bowl combine the Turkey, Bread Crumbs, Egg Beater’s, 1/4 cup of the Ketchup, 1 table spoon Worcestershire Sauce, Spices, and Garlic mixture. Mixing by hand is the best way to mix this, make sure all ingredients are well mixed. Next, press the meatloaf mixture into a loaf pan and form into a loaf, you can use any size loaf pan you want. Take the remaining Ketchup and add 3 Tablespoons Worcestershire Sauce and 3 Tablespoons Heinz 57 Sauce, and stir to well mixed. Add as a topping for the meatloaf. Baste the meatloaf with half of mixture and baste it again after 30 minutes of baking. Bake in a 350 degree oven for 50-55 minutes (Internal temperature should reach 165 degrees.) Remove from oven and let stand 5 minutes before serving. All the Ingredients come together to make one delicious Meatloaf. I really like the recipe for the Sauce! I also heated up some Bob Evans Mashed Potatoes and a small can of Del Monte Cut Green Beans. Not only is this a great dinner but with all the leftovers it’s going to make some killer Meatloaf Sandwiches also! For dessert later a Jello Sugar Free Dark Chocolate Pudding. 2. Add the Garlic in melted butter for 4 minutes, stirring occasionally. 4. Combine turkey, bread crumbs, egg, 1/4 cup of the Ketchup, 1 table spoon Worcestershire sauce, spices, and garlic mixture. 5. 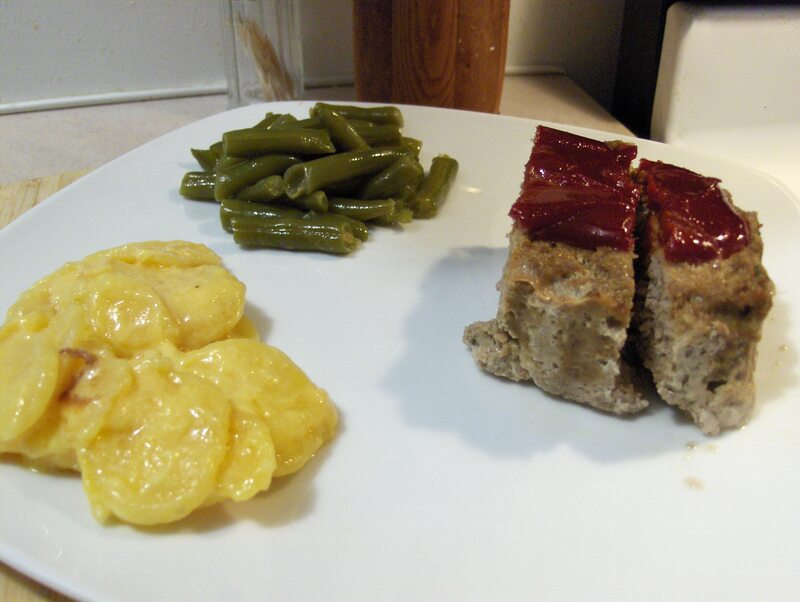 Press meatloaf into a loaf pan. Another hot and humid day around here today. Inside cool and comfortable along with a hearty comfort food dinner! 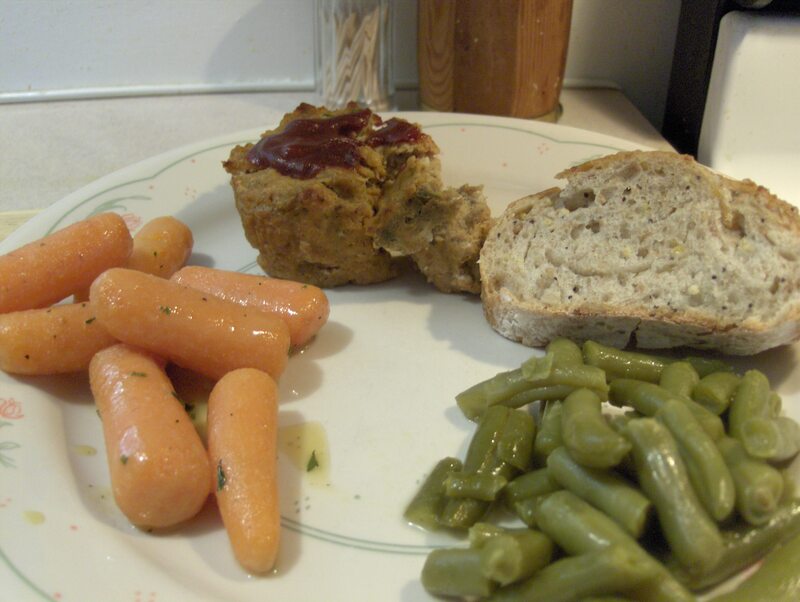 I prepared Turkey Meatloaf along with Glazed Carrots, Green Beans, and Harvest Grain Bread. I used 3 mini foil pans for the Meatloaf, freezing one them for later. For the Turkey I used Honeysuckle White Ground Turkey Extra Lean (99/1). Very easy recipe. To make your Sauce topping you’ll need Ketchup, Worcestershire Sauce, and Heinz 57 Sauce. For the Meatloaf you just combine your spices, (Roasted Ground Cumin, Onion Powder, Parsley, Ground Thyme, Sea Salt, Pepper) melted Butter, and Minced Garlic with the Ground Turkey, Ketchup, and Bread Crumbs. Put equal amounts in your pans or pan and bake at 350 degrees for 50 – 55 minutes. 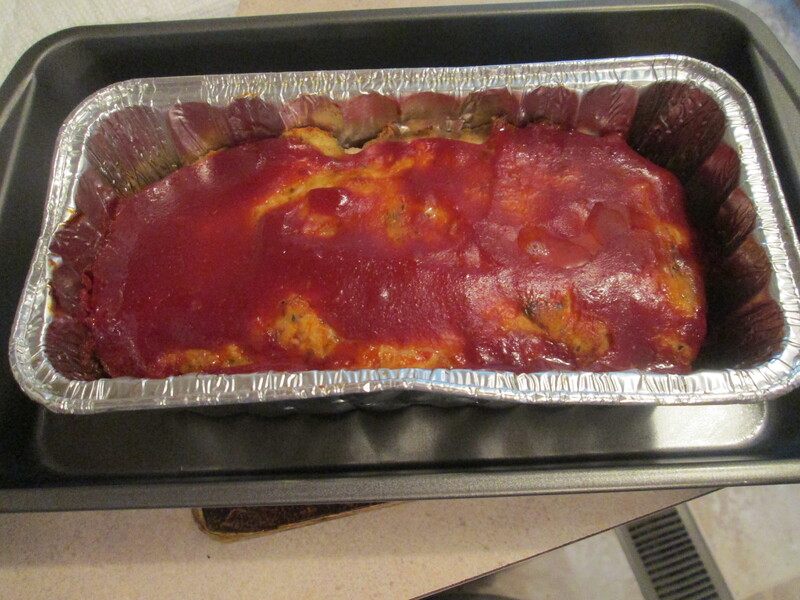 It comes out one delicious Turkey Meatloaf! I left the recipe at the end of the post along with the Glazed Carrots recipe. For sides we had Green Beans, Glazed Carrots, and baked Harvest Grain Bread. I used Del Monte Green Beans in a can, just warmed and serve. I used mini carrots for my Glazed Carrots. Just boil the Carrots and in a large bowl combine 2 tablespoons Honey, 1 tablespoon Olive or Canola Oil, 2 teaspoons Dijon mustard, 1 tablespoon fresh chopped Parsley, 1/4 teaspoon Sea Salt, and 1/8 teaspoon Pepper. When the Carrots are tender drain the water and add the Carrots to Honey mixture and lightly toss till all Carrots are coated, and serve. i baked the Harvest Grain Bread Roll at 400 degrees for 12 minutes, Love that Bread! For dessert/snack later just some Presidents Pub Spreadable Cheese on Ritz Whole Wheat Crackers. 2. Garlic in melted butter for 5 minutes, stirring occasionally. 4. Combine turkey, bread crumbs, egg, 1/4 cup of the catsup, Worcestershire sauce, salt, and pepper with garlic mixture. 5. Press meatloaf into an 8×4-inch loaf pan. 6. Spread remaining catsup on top. *In 2-quart saucepan, heat 1/2 cup water to boiling. Add carrots. Cover; simmer 10 to 15 minutes or until tender. Drain. *In medium bowl, mix remaining ingredients. Add carrots; toss lightly to coat. The wind chill was 2 degrees this morning, BRRR! It’s going to be a cold and blustry day around here so what would be better than a hot and healthy comfort food dinner to the insides up. i had previously made Turkey Meatloaf and had a mini pan frozen. I sit it out in the morning and it was ready to be warmed by dinner. I never was a fan of Meatloaf until I started making my own using Ground Turkey. Now it’s one of my favorite comfort foods. I’ll leave the recipe at the end of the post. Along with the Turkey Meatloaf I had sides of Green Beans and Mashed Potatoes. I used Healthy Life Whole Grain Buns for my sandwich. For a dessert/snack later a bag of Jolly Time 100 Calorie Mini Bag of Pop Corn. Stay Warm! 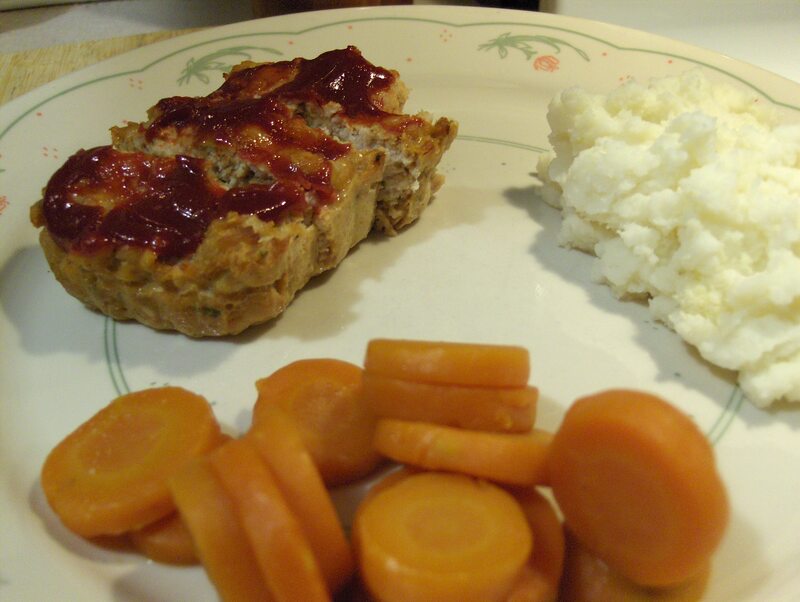 Comfort food delight,We had Turkey Meatloaf tonight!. I really like this recipe. Easy to fix, delicious, and lower in carbs and calories than most meatloaf. I made it in 3 mini loaf pans, 1 for dinner and 2 to freeze. Nothing but good things for the seasoning, Smoked Cumin, Onion Powder, Ground Thyme to name a few. Another good thing are the Meatloaf left overs which means Meatloaf Sandwiches! I listed the recipe at the end of the post. I had sides of boiled Sliced Carrots, Idahoan Mashed Potatoes, and Healthy Life Whole Grain Bread. A slice of Pillsbury Nut Quick Bread for dessert later. Ahhh Meatloaf Leftovers! Warmed up the Meatloaf left over from last night’s dinner. It’s just as good the second time around! Topped it with just a little more Ketchup and a couple of dashes of Worchester Sauce and served on an Healthy Life Whole Grain Bun. For sides I had Boiled Mini Carrots along with Bob Evans Glazed Apples. For dessert/snack later this evening I’m having Triscut Reduced Fat Baked Whole Wheat Crackers along with some Cracker Barrel 2% Sharp Cheddar Cheese and slices of Hormel Turkey Pepperoni. 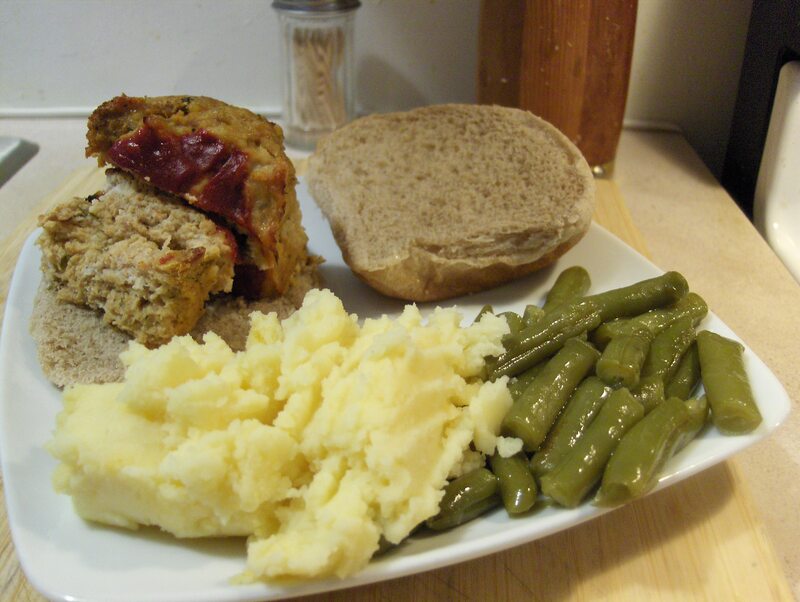 With a cool, crisp Fall day at hand today a Turkey Meatloaf sounded just right for dinner! I used Jennie – O Extra Lean 97/3 Blend of Ground Turkey. Easy to fix, delicious, and lower in carbs and calories than most Meatloafs. I made plenty so there would be leftovers which means Meatloaf Sandwiches! I listed the recipe at the end of the post. For sides I warmed up some of the Idahoan Au Gratin Potatoes I had left over from last night along with Green Beans and Healthy Life Whole Grain Bread. Later for dessert/snack it will be Chip’ins Pop Corn Chips along with Kroger Organic Black Bean and Corn Salsa. 2. Cook onion and garlic in melted butter for 5 minutes, stirring occasionally. 4. Combine turkey, bread crumbs, egg, 1/4 cup of the Ketchup, Worcestershire sauce, salt, and pepper with onion mixture. 6. Spread remaining Ketchup on top. Leftover day for dinner! I had the leftover Turkey Meatloaf from the other night and if possible it was even better the second time around. I warmed the Meatloaf up a bit and served it on Healthy Life Whole Grain Bread with a dab of Ketchup on top. I also used the leftover Glazed Sliced carrots. This Meatloaf is a keeper! I’ll be fixing this again soon. For dessert/snack tonight a 100 Calorie Bag of Jolly Time Pop Corn. 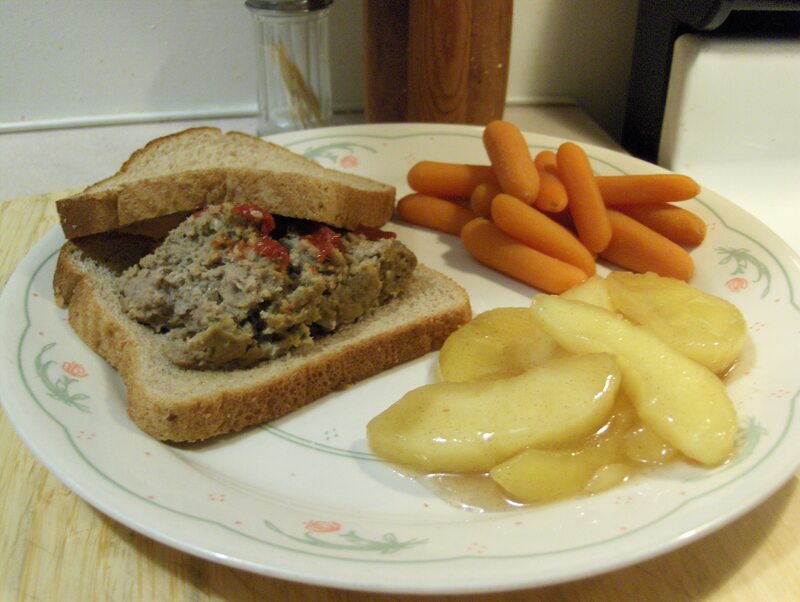 Today’s Menu: Turkey Meatloaf w/ Sliced New Potatoes, Honey Glazed Sliced Carrots, and Harvest Grain Bread. It’s a COMFORT FOOD Heaven for dinner tonight! 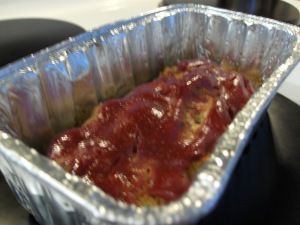 I made a Turkey Meatloaf that was perhaps the ultimate in Turkey Meatloaf! I know I’ve done something good when my Mom takes a bite and says ” Mark I think that’s some of the best Meatloaf I’ve ever had”. I listed the recipe at the end of the post. For the Turkey I used Honeysuckle White 93/7 Ground Turkey. For sides we had boiled Sliced New Potatoes that were seasoned with Sea Salt, Ground Pepper, Ground Thyme, Cumin, and Parsley. Also had Green Giant Honey Glazed Carrots and Kroger Bakery Harvest Grain Bread. 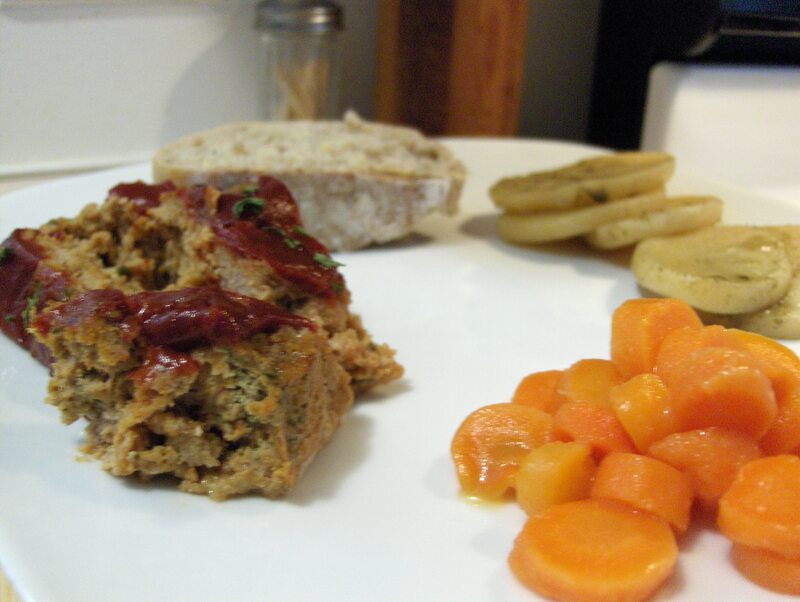 Try the Turkey Meatloaf its delicious! Another good thing there was a lot of Meatloaf left over and that means, Meatloaf Sandwiches! 4. Combine turkey, bread crumbs, egg, 1/4 cup of the catsup, Worcestershire sauce, salt, and pepper with onion mixture.